Warner Bros. Animation finally delivers a full throttle R-rated feature. Constantine: City of Demons is a dark, twisted, and incredibly violent tale of the occult. It is a ninety-minute feature film based and compiled from the CW Seed streaming series. John Constantine, the supernatural detective also known as “The Hellblazer”, first took center stage in last year’s Justice League Dark. I dug the character, but got lost in the weeds of the overly complex plot. 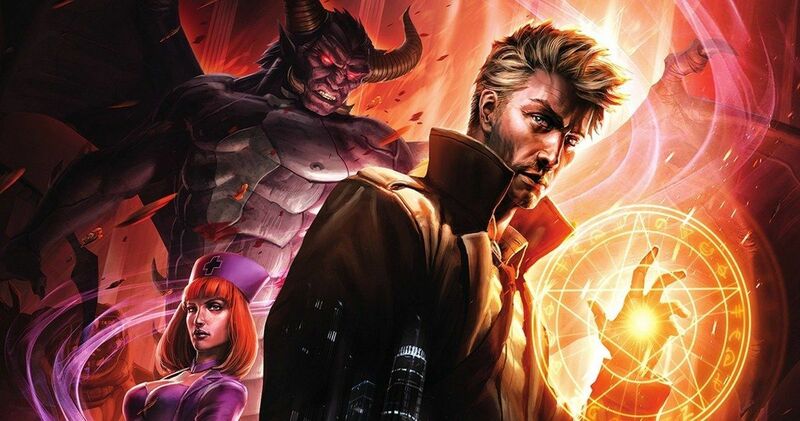 Constantine: City of Demons is much easier to follow and vastly more entertaining. The character flies solo in a gripping, bloody mystery. Constantine’s (Matt Ryan) psyche is plagued by demonic manifestations of a past failure. He’s awakened from his boozy torment by an urgent visitor. Chas Chandler (Damien O’ Hare), Constantine’s childhood best friend and former bandmate, desperately needs his help. His daughter Trish has fallen into a mysterious coma. The doctors fear she is brain dead, and recommend taking her off life support. Constantine’s exploration of the comatosed girl’s aura reveals a terrifying demon. The savage Beroul (Jim Meskimen) has trapped Trish’s soul inside his vicious heart. He forces Constantine and Chas to Los Angeles. Beroul has a mission for the detective. Follow his bidding or Trish will be damned to hell for eternity. Constantine finds strange allies on Beroul’s evil quest. But he has underestimated the true stakes of the wicked game. An ancient, powerful adversary lurks in the shadows. Constantine: City of Demons is loaded with disturbing, graphic imagery. There’s a great scene where the Nightmare Nurse (Laura Bailey) explains to Chas’ ex-wife what really exists outside of human purview. Frightening is an understatement. Constantine’s world is inhabited by horrifying creatures. Director Doug Murphy (Young Justice, Justice League Action) is a veteran animator also responsible for the CW Seed series. He knows Constantine and its evident in every bloody frame. I applaud the studio and executive producers (Greg Berlanti, David S. Goyer) for fully committing to the veracity of this character. They’ve pushed the boundaries of the DC universe. It’s important to reiterate that this is not a children’s film. Constantine: City of Demons will scare the daylight out of them. It’s meant for an adult audience and certainly doesn’t hold back. The animation, plot, and characters are all masterfully done. Gotham by Gaslight is still my favorite of the DC, R-rated features; but Constantine: City of Demons is a close second. I’ll be tuning in when the CW airs Constantine: The Legend Continues on Monday, October 15th at 9PM EST.